The Philippines’ tourism industry is off to a promising year, as monthly visitor arrivals hit all-time high of 732,506 in January, based on the latest data disclosed by the Department of Tourism (DOT). DOT officials credited the impressive figure, indicating a 15.97 percent from January last year, to the concerted efforts of “Team DOT,” the stakeholder travel and tour operators, and the ever-hospitable Filipino community. The figures gathered by the DOT Tourism Research and Statistics Division, Office of Tourism Planning, showed that a significant factor is the influx of Chinese tourists, as well as the continued arrivals en masse of Koreans, still the no. 1 visitor market. The South Koreans’ 198,145 arrivals reflect an impressive 28.36 percent rise from January 2017 while the Chinese arrivals of 111,344 indicate a 29.55 percent increase from the same period last year. “This welcome news bodes well for the tourism sector and the government’s efforts to boost the tourism industry, which is among the top contributors to our gross domestic product,” said Tourism Secretary Wanda Corazon Tulfo-Teo. Recently, Xiamen Airlines mounted a three-times-a-week commercial direct-flight services between Fuzhou, China to Kalibo, Aklan and Puerto Princesa, using Airbus A321 with 197 seat capacity. “Another new route from China that our Route Development Team is working on is the Tiajin (TJN)-Puerto Princesa (PPS). 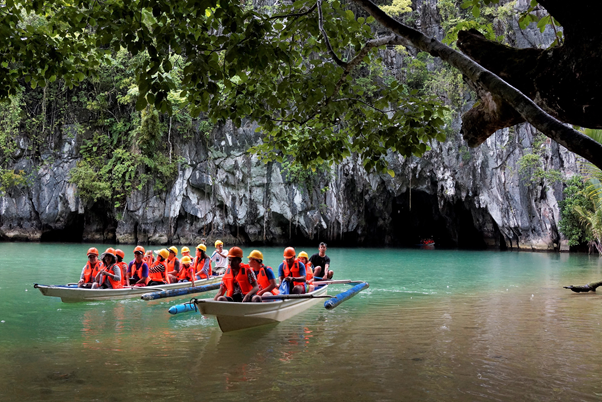 The development of new routes is in consonance with our National Tourism Development Plan’s strategy to upgrade air connectivity from major tourist source markets to the Philippines,” said Teo. Also posting a double-digit growth from January 2017 is the United States with visitor arrivals of 109,154 (14.90 percent growth) while Japan contributed with 57,038 (7.79 percent growth), and Australia with 30,924 arrivals (4.41 percent growth). Other arrivals that improved in January 2018 compared to the same period last year are Canada, 28,913; Taiwan, 18,948; United Kingdom, 18,111; India, 13,779; Singapore (13,627); Malaysia, 12,012; and Hongkong, 9,284. “I am confident that with the combined efforts of the DOT and the stakeholders, we will achieve our 7.5 million target international arrivals in 2018,” said Teo. Travel to the Philippines from UK reached 18,111 in January 2018, posting month-on-month growth by 15% vs. 2017 figures. UK remains as the most important source market for the Philippines in Europe. Hi everyone! Here is a featured content from Wino Nava, who took amazing photos of the essence of Kaamulan Festival 2019 in Malaybalay, Bukidnon.